"You wanna hear a funny one? On the way over to the island, a fella was on a coconut tree, and said he hadn't had a bite in three days. You know what I did? I bit him." Bela Lugosi, on his way to the embarrassments of Ed Wood films, spent quite a few years on Poverty Row making grade Z horror and science fiction films that ranged the gamut from terrible to awful. But there was hardly any insult worse than being directed by the notorious William 'One-Shot' Beaudine. His only desire was to get an hour or so into the can, as cheaply as possible, whether or not a retake would help. The cheesiness of his method is palpable in this horrifically bad movie that almost immediately was sold to television under the name The Boys from Brooklyn. Martin and Lewis wannabes Duke Mitchell and Sammy Petrillo play themselves, marooned on a tropical island, Kola Kola. Duke immediately falls for the beautiful native princess Nona (Charlita), while Sammy is pursued by her immensely fat younger sister Saloma (Muriel Landers). Nona was also college-educated and works as a lab assistant for Dr. Zabor (Lugosi) in his mysterious castle. Don't ask why a European castle is on a tropical island. No explanation is offered. Unfortunately, Dr. Zabor has a thing for Nona himself. Since he's experimenting with a chemical form of evolution, Zabor takes the opportunity to inject Duke and turn him into a gorilla. Hijinks ensue. Duke Mitchell is bland and talentless, but he nonetheless gets two songs, including what must have been intended to become his signature song, 'Deed I Do. He tries to emulate the cool of Dean Martin, but can't manage it at all. Oddly enough, he went on to headline at Martin's own nightclub for several years. Petrillo does a maddeningly on-point imitation of Jerry Lewis, with frenetic goofiness that is completely relentless. Lugosi seems to be having a good time in what would be his last semi-decent part; the deconstructionist tendencies implicit in the title are emphasized in the story as both Mitchell and Petrillo recognize him as Bela Lugosi, though Bela himself is oblivious to the joke. Poor Bela is the only redeeming characteristic of this picture, and the only reason why it hasn't fallen into well-deserved oblivion. Lugosi is always entertaining here though, and brings this movie back into the so-bad-it's-good class. There's not much else to say about the film. The sets are obviously stages, and the script is uniformly awful. The quotation is one of the highlights of the 'humor' on display here. I can't imagine who the target audience was. The humor could only be appreciated by five-year-olds, but they would be bored to tears by the heavy padding of native dances and stock footage that Beaudine uses to round this mess out to feature-length. The ending is a cheat that will infuriate even the most tolerant audience. There's little to recommend this except as an MST3K feature. But there is a lot to work with there, and in the proper frame of mind can provide a bit of empty-headed drive-in fun. Image Transfer Review: When told that you can't polish a turd, Stanley Kubrick is said to have responded, "You can if you freeze it." What we have here is a deep-frozen, highly varnished little turd. It's astonishing that a movie this bad could look this good. Other than the beaten-up stock footage, the feature looks absolutely fabulous, with a rich black and white palette that features a multitude of variations on gray. A few speckles are evident at the reel changes, but otherwise it's completely flawless. In this sharp and clear transfer, one can see in nauseating detail how badly Lugosi let himself go; his teeth are obviously black rotted stumps, a detail that I would have been just as happy not knowing. Audio Transfer Review: The sound isn't quite as nice as the picture, but it's still pretty good. Other than a prominent tape hiss and some occasional noise, the audio is clear and undistorted. It's not terrible by any means, and again better than the movie deserves. Extras Review: The disc contains a dupey and blurry trailer that better represents the way that this movie is usually seen; it merely points up the incredible job that was done on the transfer and presumably in digital cleanup. The best extra is a recent interview with Sammy Petrillo. He's still with us in no small part due to the fact he was a mere 17-years-old when the movie was made. He has a few good anecdotes and an obvious fondness for Lugosi that's quite heartwarming. It's also nice to see him in a non-Lewis mode. Wrapping up the package is a good set of production notes on the booklet. Chaptering is quite good, with 16 chapter stops for a brief picture. In all, much more than I expected here, and a step up for the usual Wade Williams collection DVD. 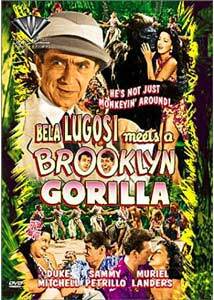 Bela Lugosi continues his decline despite getting his name in the title; hampered by highly incompetent costars, Bela still makes the proceedings fun in a grade-Z manner. A gorgeous transfer and a few interesting extras make this worthwhile for fans of high camp and cheese.